Cut the chicken breasts into 1 to 1.5 cm cubes. Sprinkle with salt, pepper, minced, with nutmeg and pour sesame oil. Mix thoroughly and let stand for 30 minutes. We grind peanuts into smaller pieces and carefully fry with dry pan. Put aside the fried peanuts. We are preparing chicken skewers. Chicken pieces speared on a toothpick. Always only 3-4 skewers grill at a time in hot oil 5-5 minutes. Then we pour the meat soy sauce and honey and let the mixture caramel about 3 minutes on each side. 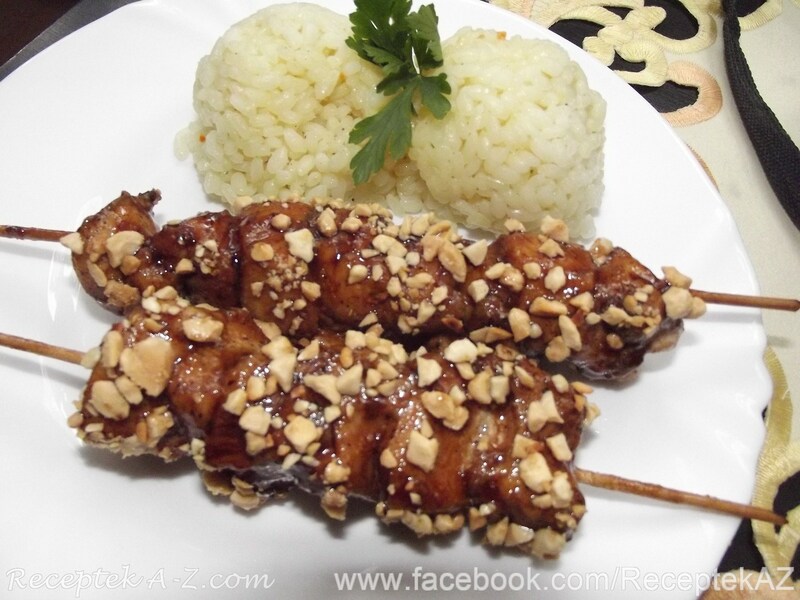 Finished skewers sprinkle with peanuts. Serve with rice and potatoes.